The Civil War was fought and slaves were free. And now young Gabe wants to find his mother, Rosie Lee, sold away long ago. But finding her won’t be easy. On the road, Gabe meets other people in search of their families, too — brothers, sisters, mothers, fathers — families torn apart, sold to plantations far away from each other. They sing songs, tell stories, share dreams about their future as free people. Gabe finds many disappointments during his months-long journey, but the image of his mother’s smiling eyes keeps him strong. 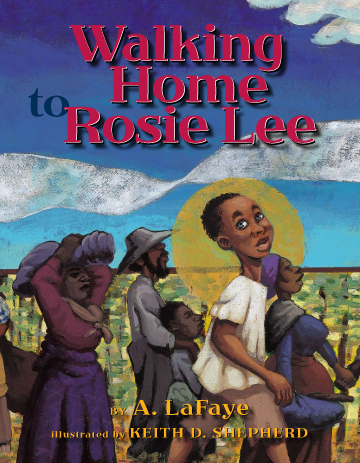 WALKING HOME TO ROSIE LEE offers young readers a glimpse into a journey made by many African Americans trying to find their loved ones following the Civil War and emancipation of slaves. A. LaFaye tells the story in an authentic southern voice, with an emotional arc that tugs at the heart. Newcomer Keith D. Shepherd’s rich acrylic paintings bring the story to life. A truly wonderful pairing of words and pictures. For more information on this chapter of our nation’s history, an author’s note encourages readers to take a look at FROM SLAVERY TO FREEDOM, by John Hope Franklin and Alfred A. Moss, and African American history museums like the Smithsonian national Museum of African American History and Culture, online at http://nmaahc.si.edu/. Love the topic! So important. Can’t wait to read the book. Eager to see this one. Sounds super. Many thanks for the alert.